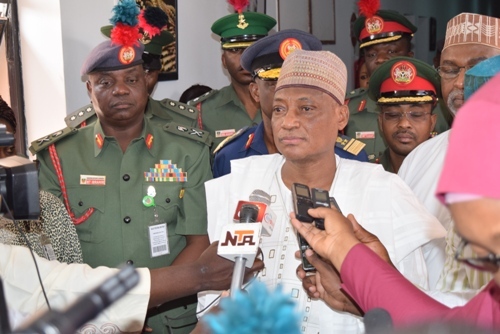 The Peoples Democratic Party (PDP) has accused the Minister of Defence, Mansur Dan-Ali, of diverting funds meant for the military equipment and welfare of soldiers to the campaign of the APC. In a statement on Monday by the spokesperson of the PDP, Kola Ologbondiyan, party accused the minister of diverting part of the military funds to produce APC’s campaign materials including an electronic memento book, on which he was alleged to have ascribed credit to himself and the APC. The PDP said it was sad that this was happening when the soldiers were allegedly suffering neglect in the war front. He said: “Our party considers it insensitive and a gross impunity for the Minister of Defence to be engaging in patronising souvenirs for President Buhari at a time when our soldiers are being killed in their numbers. “Nigerians can now see how the Buhari Presidency and the APC have turned the Ministry of Defence into their Automatic Teller Machine to fund their re-election, at the detriment of our citizens who are being attacked daily by insurgents and marauders in various parts of our country.